Now that Halloween has come and gone, it’s time to start thinking about the holiday season. For many Bay Area residents, this means hosting Thanksgiving or Christmas dinner. 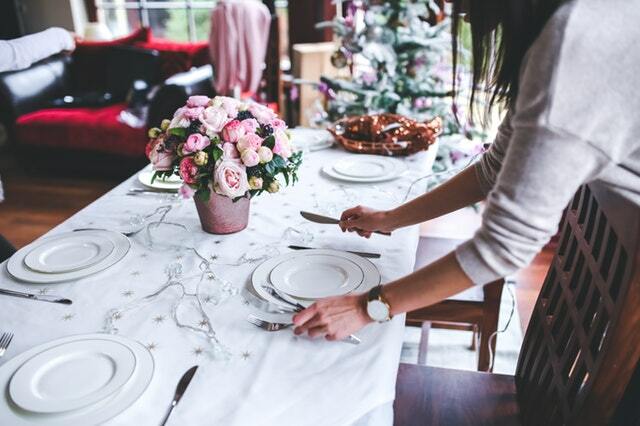 This can be a very rewarding experience (minus cleaning up after the feast), but when entertaining guests with hearing loss, a little extra prep work is needed. Taking a few steps to ensure the needs of your hearing-impaired guests are met will ensure a successful and enjoyable holiday for everybody gathered around your table. Even Aunt Bethany and her questionable Jell-O mold! People with hearing loss have a difficult enough time on a normal day. The holiday season can exacerbate their woes; while others enjoy the spirit and wonder this time of year can bring, individuals with hearing loss may feel cut off from others, leading to withdrawal, isolation, and depression. Taking the time to cater to guests with hearing loss will go a long way toward making them feel included this holiday season. The following steps will help make your hearing-impaired guests feel at home. It all starts with the way you set up your home. Provide adequate lighting, as those with hearing loss often rely on facial cues to aid in communicating. A well-lit room allows them to easily see facial expressions and the mouths of people who are speaking. Seat them in a quiet corner if possible, away from the hustle and bustle of the kitchen. If you’re playing music, keep the volume low. Background noise makes it difficult for a person with hearing loss to follow the conversation. The same applies to the television; football games are synonymous with the holiday season, but there’s no need to turn up the sound. Third-and long, we get it. Pay attention. If the person with hearing loss acts quiet or appears uncomfortable during a holiday event, they may be having trouble hearing. Try to include them in the conversation as much as possible. Face the person when speaking. Directly facing a hearing-impaired individual makes it easier for him or her to understand your words and allows them to see your mouth and facial expressions. Speak slowly and clearly and avoid using complicated words or phrases. Do not mumble or shout, and refrain from shoveling mashed potatoes and other food into your mouth while speaking. Not only is this rude and disgusting, but it impedes their ability to decipher what you’re saying. Don’t cover your mouth with a napkin or your hands, either. Rephrase rather than repeat. Your natural instinct may be to repeat yourself if the hard-of-hearing person is not understanding you. Instead, try rephrasing what you have said using a different word. Often, one particular sound proves troublesome. Remain in close proximity. Do not attempt to hold a conversation from across the room. Stay in close proximity to ensure better understanding and allow the individual to see your mouth and facial expressions. Following these steps will help ensure you and your guests have a happy holiday season, even if you don’t get that official Red Ryder, carbine action, 200-shot, range model air rifle, with a compass in the stock and this thing that tells time that you’ve always coveted. Which your San Francisco thinks is probably a good thing anyway – you wouldn’t want to shoot your eye out!